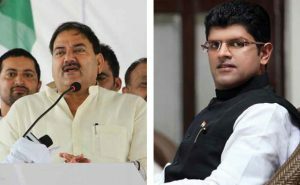 Haryana, where centuries ago battle of’ Mahabharat was fought between Pandavs and Kauravs, for supremacy, is witnessing yet another Mahabharat like sitiation, this time between Ajay Chautala and Abhay Chautala, grandsons of former deputy prime minister of the country, Devi Lal. The battle is for controlling the Indian National Lok Dal Party which Ch. 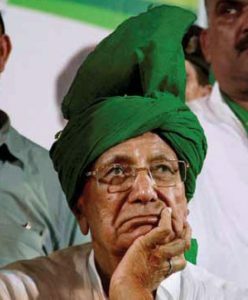 Devi lal had nursed with his labour of decades followed by efforts of his son Om Parkash Chautala, former chief minister of Haryana. On one side of battle are Ajay Chautala, his MLA wife, Naina Chautala, MP son, Dushyant Chautala and Digvijay Chautala. Other side is represented by Abhay, leader of opposition in Haryana assembly having tacit blessings of father Om Parkash and trusted followers. Dushyant has described it as conspiracy against him, his brother Digvijay and father Ajay, hatched by some one who wanted to grab the control of the party. Dushyant told Tehelka, “some Jaichand in the party has tried to trap me in Chakravayuh like Abhimanyu of Mahabharat adding that they should not forget that I, with the help of party workers, is capable of breaking that’ Chakrvyauh. Training his guns on his estranged uncle Abhay, who is leader of opposition in Haryana assembly, Dushyant thundered that someone are playing role of B- team of ruling party in Haryana assembly, a charge which former Haryana Chief Minister, Bhupinder Singh Hooda often level against Abhay Chautala for his alleged soft corner towards the ruling BJP, Government. At age of plus eighty, Om Parkash, former Chief Minister of Haryana, who has successfully faced many political challenges including Mehyam in Meham during by-poll of Meham assembly in Rohtak district of Haryana in nineties when he had to resign from chief minister ship following poll violence, and is currently undergoing ten years imprisonment in alleged bungling in recruitment of teachers ,is facing toughest challenge of his life. Even while in jail he had made party united.But now his grandsons Dushyant and Digvijay has revolted against him although they both say that they held our grandfather in high esteem but also throw’s hints that he was under captivity of Abhay. 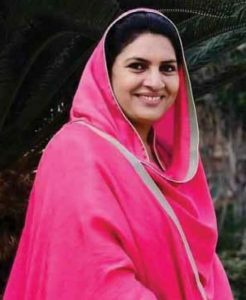 In the battle their father Ajay and mother Naina Chautala, MLA, are siding with them .Naina is also drawing huge crowds of women during her mass contact program. Naina alleges that there is conspiracy against her family. Interestingly, history is repeating itself in Devi Lal clan as three decades back both sons of Devilal, Ranjit Singh Chautala and Om Parkash Chautala had fought against each other for attaining legacy of Ch. Devi Lal. In that battle Ranjit Chautala was loser with Devilal putting his weight around elder son Om Parkash Chautala Ranjit Chautala had later joined Congress party. At that time Ch. Devi Lal used to watch the popular’ Mahabahrata’ seirel on T.V.Such was his craze for the serial that once while he was coming to Chandigarh from Delhi via train, a TV set was installed at Ambala railway station so that he could watch the’ Mahabharata’ serial. From Ambala to Chandigarh Devi Lal has traveled by Car skipping the train journey.It is said that now Devilal is watching the ‘Mahabharat between his family from the heaven. Interestingly Ajay Chautala has called himself as ‘Pandav’ and his brother Abhay Chautala as Duryodhan’. Ajay Chautala who is on fourteen days parole from jail is touring the state meeting his old associates. If accusations of Dushyant Chautala of conspiracy are to be taken at face value, then it is shocking commentary on the state of affairs going in family for controlling the control of the party. Dyshyant Chautala while narrating sequence of events right from Gohana rally and their ultimate suspension from the party told Tehelka “In Gohana rally which was organised on occasion of birthday of Devilal, some over enthusiastic workers were expressing their happiness which was dubbed as sloganeering by Abhay Chautala as part of a bigger conspiracy to oust us from the power”. 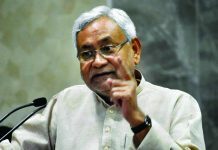 Dushyant Chautal further clarified that show cause notices were issued to him and his brother Digvijay Chautala for disturbing the rally and when he sought evidence, which was denied. Later he and his brother got suspension letter purportedly signed by Om Parkash Chautala alleging that report of so called disciplinary committee was prepared in a closed room and signature of Om Parkash Chautala were procured. 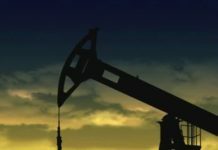 Dushyant Chautala told that it is hard to believe that Sh. Om Parkash Chautala has signed the letter of their suspension. Dushyant Chautala even alleged that taking advantage of imprisonment of their father Ajay Chautala who is also undergoing imprisonment along with Om Parkash Chautala in alleged bungling in teachers recruitment, some’ Jaichand’ conspired to throw them out from the party. He regretted that he came to know about his and his brothers suspension from media. He regrets that he was serving the party since he was fifteen years old but now he is being accused and suspended for the anti party activities from the party which he, his brother,Digvijay Chautala and father Ajay Chautala had nursed with their blood .Digvijay Chautala is active among youth and students. 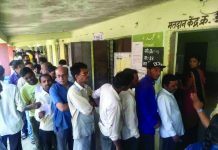 According to political observers, party is on verge of vertical split with Ajay Chautala calling meeting of his supporters in Jind (Haryana ) to seek workers support and it is widely believed that on that day a new party could be launched Choice of Jind is significant as from here Ch. Devi Lal has launched his agitation against Rajiv-Longowal accord in 1986 and ultimately caricaturing power in Haryana. All eyes are set on outcome of Jind meeting and reports reaching suggests party workers and supporters will force them to declare launching of new political party. Family members including daughters and sisters also tried for patch-,up but in vain.Former Panjab Chief Minister and Akali leader, Parkash Singh Badal with whom Chautala family had family relations is also trying for some sort of patch-up between estranged brothers but it is widely believed that stage has reached to flash point and there does not seems hope of patch-up as it is battle of power. 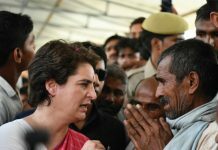 The BJP and Congress party are also watching the developments with keen interest INLD has entered into electoral alliance with Bahujan Samaj party and with anti incumbency of BJP and fierce infighting in Congress party, it was widely believed that INLD-BSP. alliance will perform well in ensuing Lok Sabha and state assembly polls. But due to vertical split at this crucial time, there are questions mark over party,s performance. Till date party,s alliance with B.S.P is intact and after this infighting, Abhay Chautala had met B.S.P, supremo, Mayawati.But it is to be seen whether alliance remains or breaks in future. Four years back Ajay Chautala was natural successor of legacy of Om Parkash Chautala and he was calling shots in the party. But situation changed with Ajay Chautala and his father Om Parkash Chautalas imprisonment. Ajay Chautala and Om Parkash Chautala could not contest elections and Abhay Chautala won assembly polls and was elected leader of Opposition in Haryana assembly with facilities of a cabinet rank minister.During this period, Abhay Chautala made all out efforts to galvanize the party with launching agitation on issue of construction of S.Y.L, canal which will bring Ravi-Beas waters to arid fields of the state. In meantime Dushyant Chautala and Digvijay Chautala also started taking active role in activities of party under banner of Indian National Students Organisation and Dyshant Chautala attained stature with winning Hisar Lok Sabha seat. Youth started attracting towards them. Next articleLord Ram to return in 2019 polls?